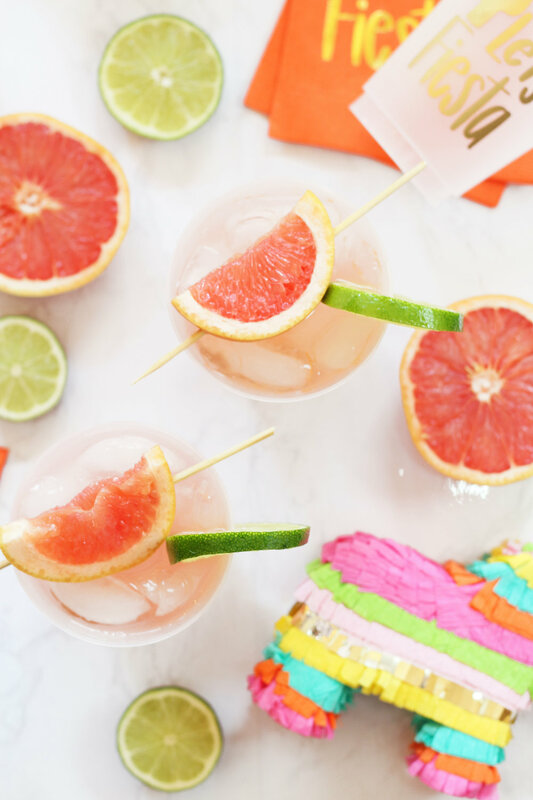 Pink Grapefruit Margarita Recipe — When it Rains Paper Co. | Colorful and fun paper goods, office supplies, and personalized gifts. My favorite fruit in the WORLD is a pink grapefruit. As luck would have it, I live with a sister who completely hates the smell and sight of anything citrus. (With the exception of limes. Who knows?) When I eat a grapefruit, she leaves the room. Needless to say, we aren’t whipping up many cocktails that include grapefruits at our house. Whenever I see anything grapefruit related at a restaurant or bar I’m all over it. As fate would have it, when we arrived at our hotel on Marco Island, I picked up a bar menu and the first thing on the list was a fresh squeezed grapefruit margarita. It was like the clouds parted and music started playing. It was the most delicious, fresh squeezed margarita of my life and I’ve been trying to replicate it ever since. With Cinco De Mayo coming up, it seemed like the perfect time to share the recipe that I found tasted most similar to my Marco Island Marg. And let’s be honest- I’ve sampled a few. All the credit goes to Ina Garten because she makes a killer grapefruit margarita that immediately transports me back to the beach. I mixed my margaritas a little differently but feel free to take a look at her recipe too! Step 1 | Take a lime wedge and rub around the edge of your glasses. Dip into salt and set them aside to dry. Step 2 | Mix together grapefruit juice, lime juice, orange liquor, tequila and stir together. If you prefer your margarita a little on the sweeter side feel free to throw in some simple syrup! Step 3 | Fill glasses with with ice, pour mixture over ice, garnish with lime or grapefruit wedges, and serve! Pair this pink margarita with some of our Let’s Fiesta cups and napkins and you’re sure to host the cutest Cinco De Mayo party on the block!